We are pleased to announce that development has started on the Event Espresso 4 mobile ticketing apps for Android and Apple mobile devices. For the initial release, we are only working on feature parity with the Event Espresso 3 version of the mobile apps. Such as viewing events, registrations, and checking-in/out attendees from the mobile apps. We care about your ticketing needs and want to make your lives better. You’ll be able to do check-in/out attendees, and those who use the Ticketing add-on will be able to scan tickets too. The plan right now is to get the apps built, tested and release ASAP. If everything goes as planned, we can expect the development to take around 10 to 12 weeks. What functions will the apps perform? 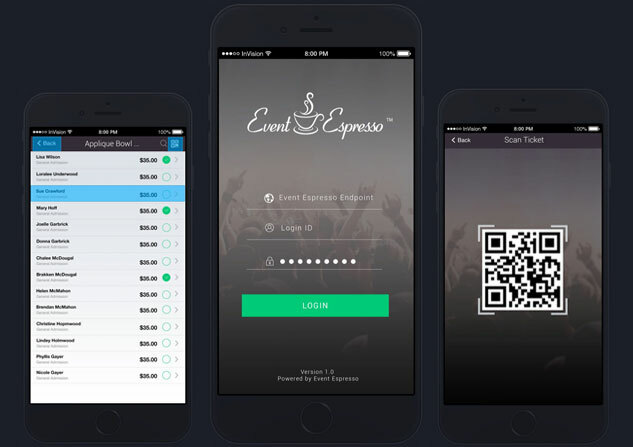 Event Espresso users will be able to check-in/out attendees and scan tickets using mobile devices, such as iPhones, iPads, and Android phones and tablets. We have a few ideas for features such as point-of-sale capabilities, etc, but these will have to come at a later date. The team we’ve brought on to build the mobile apps has a lot of experience with building event related apps and we’re looking forward to working with them to add more great features in the future. Tell us what you need/want? Have some ideas you want to see the in Event Espresso mobiles apps? Let us know in the comments below. This will be a great help. Please keep pursuing point-of-sale capabilities. That is our biggest wish for EventEspresso. This is on the list of features we plan on adding in the future. Fantastic! Thank you so much this will make life so much easier. Looking forward to it. We are desperately waiting for this app for EE4. The biggest issue we see with the previous app is about sharing credentials. We just want to host events & sell tickets but we want the event hosting party to scan the tickets by themselves only. We don’t want to share any credentials with our customers. 1. It should have ability to scan the tickets in offline mode. 2. Customers (People who host the event on our website) should be able to scan the tickets for their events by themselves so that we dont have to share the admin id & password with them. 3. There should be some key that we can share with the customers instead of user id & password to login in the app & get the tickets scanned at the door. 1. That is a feature we plan to add in the future. 2. When the admin logs in to the app, it respects whatever capabilities are assigned to that user’s role. So if you have a user with the role of “Event Manager”. 3. That’s a feature we are planning on implementing in the future as well. Please add a Windows 10 mobile and universal app too, as it is our company’s official platform. I am looking forward to this feature. I would like to give access to different teachers (as I am running classes using this app) It would be good if they could only access their class. Point of sale would be a great feature, as some students will want to sign up and pay at the door. Thanks for the feedback. I think the built-in roles & capabilities system might help with the user access. Point of sale functionality is a feature we are planning on implementing in the future as well. We hope that this app will support the QR scan for the checkout too. The current EE3 ticket app allows only the scan for check-in, while the check out has to be done manually. We need to log the entry and exit times, and every time our events end it’s a big problem to manually record all the check-outs! I’ll note the feature of capturing entry/exit times as a feature request. Finally. I hope you will finish on time. A lot of success in the work. Thank you! We’ll certainly try our best. Will the mobile ticketing app include anything to log in and log out of an event so that stats can be tracked as to attendance? We run large seminars world wide where attendees need to be present for 90-95% of the time and can miss a half day or so. If this was available then we would be able to get scanners on entry and exit to make sure people were present for the required number of hours. The mobile apps will essentially communicate check-ins/outs back to your website and Event Espresso will log the data. However, currently, I think only the number of check-ins per ticket will be tracked. I’m going to submit a feature request for tracking the entry/exit times in Event Espresso. Sounds great, we’ve been looking forward to this. As far as feature requests, because our events are free we don’t need full point-of-sale capabilities, just the ability to add “walk-ins”, i.e. on-the-spot registration and check-in. Is that something that might be considered? Yes, on-site registration capabilities are being considered for a future version. First, we have to extend our REST API to facilitate this type of feature. A POS system would be a tremendous help for us. It actually might address our biggest vulnerability for same day ticket sales. Has EE considering integrating with Square? Reason being, if same day sales (walkups) could be serviced by kiosks (like movie theatres) then a fan or a clerk could swipe the credit card and print off a valid ticket (with barcode but without name/email) that could be scanned by either scanners or iOS apps, then everyone would win in our world. We would have accurate counts of attendees, every person would have a ticket (for re-entry) and Square keeps us out of the credit card compliance business. Thanks for the feedback! We plan on adding these features in a later revision, once our REST API can support registrations and payments. Just purchased your product and were planning on going live next weekend until we realized there is no way to efficiently check people in. I have read all the support articles but neither the admin interface or bar code scanner are realistic solutions. We have a number of upcoming events and are trying to determine whether EventEspresso is a viable option how realistic is a 10-12 week development time? We’ve found that we needed to create additional endpoints in the REST API, so that may, or may not slow things down a little. Plus, we are at the mercy of the Apple and Android submission process after the app are completed. In the interim, you could use a scanner on a mobile device that is capable of passing the scan results to a text field in your mobile browser. The admin check-in page is also optimized for mobile browsers. What is the latest update on time frame. I am very excited for this. We are beta testing the apps now. Will the App be available in May? Pretty sure we’ll be publishing the apps any day now. I love Event Espresso and so far it is working well for us. However, our organization holds a 3 day event yearly with a full schedule of mini-events, performances, games, contests, etc. I was hoping that I could build the attendee schedule into the app to allow attendees to see exactly what is going on and the location of the mini-event. Have I missed this feature, or is this in the works? Thank you.